Beautiful lot w mobile located walking distance to thousands of acres of National Forest. Also very close to Boulder Lake and famous Wolf River. This lot is private and level, great future building site. Home has a woodburning fireplace, a 10x12 shed w ramp and 6 x 8 deck w awning and concrete patio. Home is priced to move fast. Call today for showing. Great location for hunters. From Mountain, Hwy 32 to Cty Rd W West. Left on Red Pine Rd, turn right on Lonzo. Property on right. 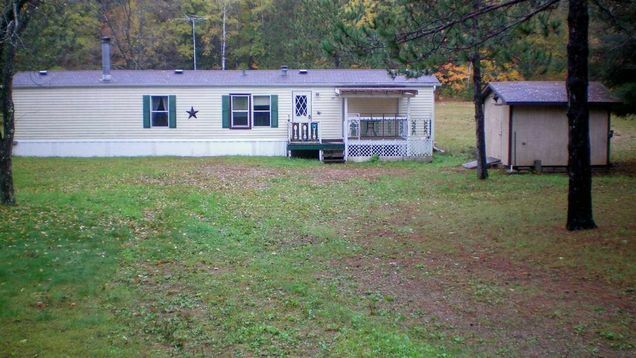 The details on 12271 LONZO LANE: This house located in Doty, WI 54491 is currently for sale for $44,000. 12271 LONZO LANE is a 840 square foot house with 2 beds and 1 bath that has been on Estately for 198 days. This house is in the attendance area of Suring Elementary School and Suring High School.